Laser Cut Metal Lanterns can be used in home, office, or religious places for the purpose of holding a candle. Moreover, the offered holder is commonly used for various decorating purposes by our customers. 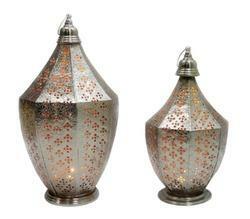 Moroccan Hanging Lanterns can be used in home, office, or religious places for the purpose of holding a candle. Moreover, the offered holder is commonly used for various decorating purposes by our customers. 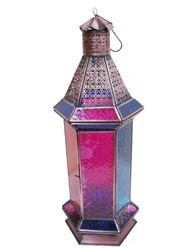 We are leading manufacturer and exporter of superior quality Moroccan Lantern Tea- Light St.
Our organization is engaged in offering superior quality Multicolor Moroccan Lanterns to our prestigious customers. This holder is manufactured from finest quality aluminum, which is obtained from the well-known vendor. 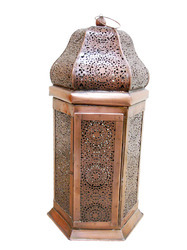 We offer a wide range of premium quality Moroccan Outdoor Lanterns to our esteemed customers. 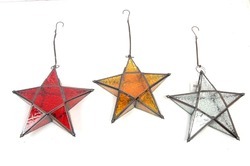 These lanterns are manufactured from fine grade metal and alloy that is obtained from highly trusted vendors. Designed as per the latest market trends, these lanterns find application in decorating interior of various hotels and restaurants. The quality controllers keep strict supervision over the entire manufacturing process, to ensure that these processes are carried in compliance with industry set standards. 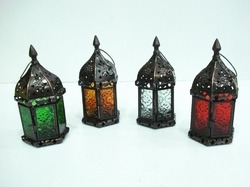 Our organizations hold expertise in offering Moroccan Mini Lanterns to our prestigious customers. 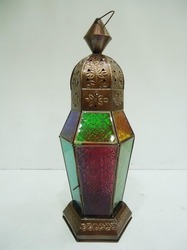 Available with us at highly reasonable market prices, the offered lanterns are widely used for decoration purposes. Designed as per the industry set standards, the offered lanterns are widely demanded in the market for their alluring and attractive design. These products are available in various sizes and shapes that best suit the requirements of our customers. Owing to the vast experience in this field, we have been able to offer high quality Floor Moroccan Lanterns to our valuable customers. 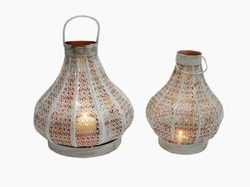 The offered lanterns are widely used by our customers for decorating interior. Manufactured from finest quality metal, the offered lantern is highly appreciated for its rich attributes such as appealing design, light weight, and corrosion resistance. 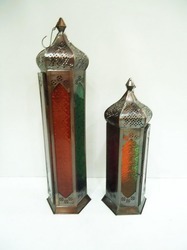 We are one of the leading manufacturers and exporters of Moroccan Glass Lanterns. The offered lanterns are widely appreciated by our customers for their rich attributes such as appealing looks, eye-catching designs, and light weight. Made as per the industry set standards, the offered products are widely used for various decorating applications. These lanterns are available in various sizes and shapes, to provide clients various options to choose from.